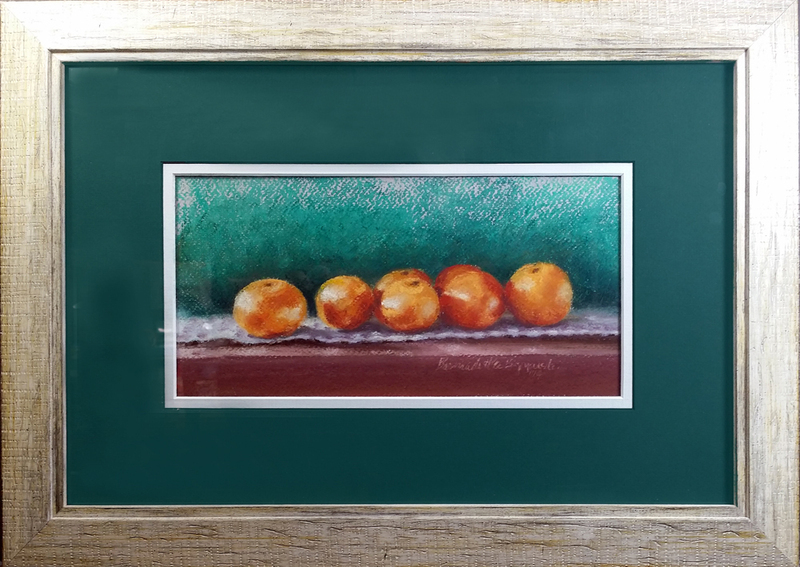 Clementines, pastel, 10″ x 5″ © Bernadette E. Kazmarski. 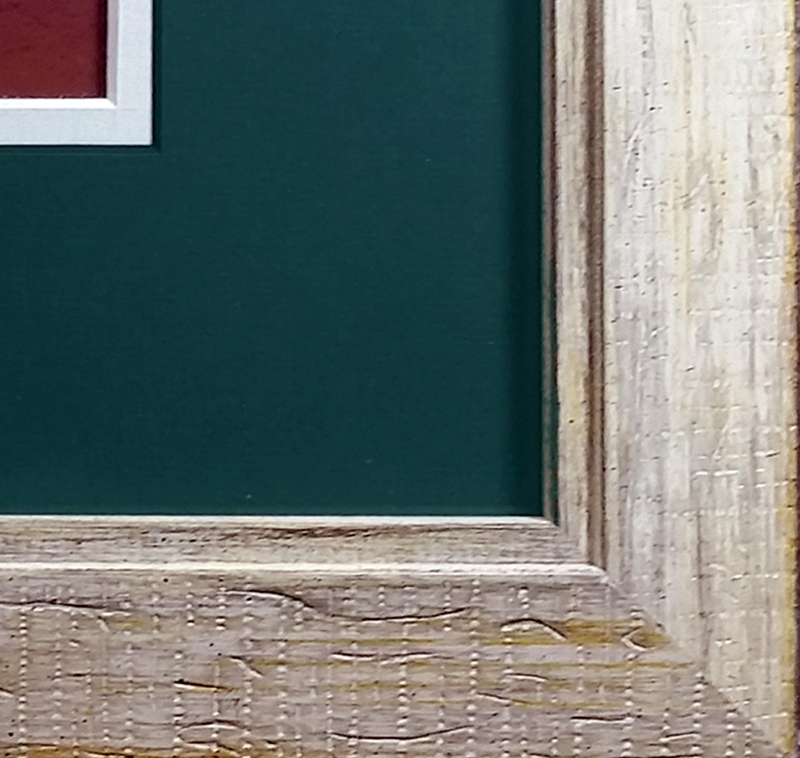 The original is sold but I can frame a digital or giclee print as you see in the sample. This sketch is drawn entirely in Sennelier soft pastels on Fabriano Pastello Tiziano paper in the warm gray threaded tone. I wanted to use the laid texture of the paper to help convey the lightly pitted texture of the Clementines, and then also to soften the edges of everything to help capture the softened angled light from the window. The light comes mainly from the left, but several fruits are also catching a softer mid-tone highlight from a window in the next room to the right. I had sorted them out of their bin since only a few were left and went to get a little basket for the. As I came back I saw the composition—the top of the cherry bookcase, my crocheted dresser scarf, the green-toned wall and of course the little stars themselves. The light comes in at a very slanted angle at any time of the year, especially winter, and for most of the day it’s reflected light from the sky with a cool tone and softened shadows. It doesn’t last very long, and I knew it was near the end of its journey on a short winter afternoon so I snapped a few photos and started a quick color sketch, but it was days before I got back to it. Glad I did, or those Clementines would have certainly lost their sweet and bright character in the meantime! It’s the nice thing about art that you can leave out things you don’t like to be there. This shelf sometimes becomes a catch-all for things, and though they were actually in the scene I just left them out. There are also things hanging on the wall, and it’s a stucco wall that’s white which I rag-painted with vanity yellow and pale mint green. In this corner the shadows are dull and I debated having a cool gray-green wall to really bring out the orange of the Clementines, one of the reasons I began with this tone of paper, which you can see at the very top. I decided instead I wanted to keep with the rich tones in the rest of the sketch and worked the shadows in green—it’s not at all a realistic choice of tone or color or even quality of shadow, but I like it, and it works. I also decided to leave a loose edge at the top, I’d visualized it this way from the very beginning. I may have liked a loose edge all around but I ran off the paper on the sides. This entry was posted on March 11, 2016 by Bernadette.